Contents January 2019 - STOP Think! 11kV Depot Cable Strike results in burns. Vandalism of Lineside Materials results in train striking metal wedge. Crawler Crane incident on M23 during attempt to load onto low-loader for relocation. MEWP Boom Failure tips basket at height. Transport for London – Fire Safety Compliance. Operator of a dumper on a public road did not have a driving licence. Introduction January 2019 - STOP Think! Learning January 2019 - STOP Think! Back to Work… Safely Our Vision Welcome back! Whether you had some time off or were working we hope everyone had a great Christmas and New Year. As each of our sites and offices return to work it was great to see our “Back to Work” Briefings taking place, re-focusing our teams on work after, what is for many, an extended period of leave. This time of year typically sees an increase in the number of accidents therefore it is important to re-evaluate the conditions and hazards on site and any changes that may have taken place over the closure period. Could a similar thing occur on this site? What do we need to change? Where could the next accident occur on this site? We also concentrated on how to look out for each other over the winter months, discussing topics such as winter driving, being fit to work, slips, trips and falls and mental wellbeing. Take extra time. Be extra aware of your environment and hidden hazards. Wear appropriate footwear. Report poor lighting on site, in offices and walkways. If you are unwell or fatigued you could put yourself and others in at risk. Both fatigue and mental wellbeing issues can affect your concentration. If you notice a change in the behaviour of the people you work with, ask them how they are and if they would like to talk about it. Has the plant on site been stood idle for two weeks? Check hoses for signs of wear. Have you put spill kits back near the plant? Are plant nappies still in the right place? Also consider our neighbours keep nearby roads clean and make sure lights aren’t shining into properties. In 2018 we had 28 injuries… But we also managed 339 days without injuring someone. What can we do to make sure it’s 365 days in 2019? We Can Achieve This! This “Design Safety Conversations Guidance Note” includes practical examples of such conversations and how to record them to ensure the learning is captured and shared accordingly. River Axe Design Close Call Learning Our team working on the River Axe Flood Mitigation Scheme raised a Design Close Call when the railway embankment was regraded to accommodate scaffolding support for a cable. The temporary condition of embankment stability was not adequately considered and although the embankment remained stable, the re-grading work could have had the potential to de-stabilise the slope, along with the railway track above. Whilst safety conversations are often used to great effect to improve the safety culture of site-based activities, this is not typically the case for design activities. Similar conversations at the design stage could provide great opportunities to help us to identify any hazards and risks in the proposed scheme and remove or mitigate these from the outset. The stability of the embankment was confirmed by track monitoring and subsequent design checks. All temporary works designers were re-briefed with the important lessons from this Design Close Call and the Learning on Page 7 was issued. REMEMBER - The Southern Shield Design Close Call Guidance Document can be found on the Southern Shield website as linked above. Record snags and include photos and drawing mark ups of the snag location. Record action responses, providing a full database through a single interface. Record site visits including who attended and discussions. Record site inspections and issue actions to iGO project members. Load, open and view iGO project documents. Take photos and store them directly against your project on iGO. View project and company iGO contacts. Log observations and allocate as actions for iGO team members. All information is stored in the iGO project without needing to be separately scanned and uploaded. Issues and observations will have a full audit trail. Defects can be identified and their resolution managed all through one single system. Site visit records can be kept electronically and analysed for trends. Like many of the processes that we come across, whilst there are limitations, these are primarily related to how the project is initially set up on iGO. The App is designed for single project use and as long as project contacts and documents in the viewing list are kept up to date it is a really effective. So if your project does not have a data capture solution, please do consider using PIM Mobile. Please contact Gavin Tidey (Gavin.Tidey@Osborne.co.uk) or Dominic Lowry (Dominic.Lowry@Osborne.co.uk) for further information and help with set-up and training. NEW! iGO Navigator Wheel All our internal people will now have seen the launch of our new Navigator Wheel. required delivery activities and access to the necessary information more quickly and without duplication or ambiguity. Our process maps have been redrawn to make our documents easier to find, with the aim that all documents can be obtained within a maximum of three clicks from the Navigator Wheel. The launch of the new Navigator Wheel also means that as Infrastructure, we now own our delivery processes, giving us and the other businesses the flexibility to continuously adapt and improve to efficiently deliver high quality, valued solutions for our customers. Many thanks to the Infrastructure Improvement Team; Gavin Tidey, Gareth Barker, Tony Dawson, Matt Whale & Stuart Worringham For your hard work and dedication to drive this important piece of work to completion whilst juggling very busy day schedules. Workforce Mental Health App A new “Construction Industry Helpline App” that has been designed to support workers around Mental Health is now available to download from Google Play or the App Store. The new App has been launched to provide real-time support to workers with their mental health. Winter Driving Tips Driving in the winter is very different to at other times of the year with longer periods of darkness and more frequent adverse weather conditions. This makes driving in the winter more hazardous. The idea for creation of Construction Industry Helpline App came from the Building Mental Health Campaign and Lighthouse Construction Industry Charity. It has been constructed by COINS and provides vital information, advice and guidance on many wellbeing topics including stress, anxiety, depression, anger and suicidal thoughts. In extreme conditions, such as prolonged periods of heavy snow or floods, always avoid driving at all, unless the journey is absolutely necessary and driving is the only option. Allow time to demist your windscreen and clear all vehicle windows to ensure you have full visibility before setting off. Drive and brake to suit the weather conditions. Allow enough distance between you and other road users. Keep twice your normal braking distance. Plan your movement ahead on the road. Tyre pressures and tread depth. Windscreen wipers and washers. Lights. Engine coolant. De-icer and scraper, warm and hi-vis clothing, emergency kit. Carrying an emergency kit is even more essential if embarking on a long journey and should include a tow rope, shovel, warning triangle, torch, blanket and rations. Pack a hot drink and ensure your mobile phone is fully charged. Keep both hands on the steering wheel. Plan a route that avoids driving over exposed bridges. Expect sudden gusts of wind, especially when passing high-sided vehicles and when exiting from tunnels. Reduce your speed or stop all together. Wear sunglasses in bright sunlight. Make sure your windscreen and all vehicle windows are clean, both inside and out. Reduce your speed. Your braking distance is 10 times more than normal so leave a big gap. Avoid harsh braking, acceleration and sharp steering. Slow down in plenty of time before bends and corners. Use a low gear earlier to assist braking. Keep your vehicle well-ventilated – heaters cause drowsiness. Sharing January 2019 - STOP Think! Connect Plus Technical Forum Towards the end of last year Mike O'Connor and Dominic Lowry attended the Connect Plus Technology Forum where Dominic presented on Osborne’s BIM capability and the efficiency benefits to the framework. This was a great learning session with interesting presentations on amongst other things, satellite monitoring of ground movements, concrete sensors and listening to expansion joints. Dominic is a BIM Level 2 Certified Practitioner and he started by making people consider the meaning of BIM and why, if we want to stay relevant, we have to pursue this capability. An enforced set of rules to follow as directed by Publicly Available Specification (PAS) or within a British Standard (BS). Deals with project collaboration for information transfer. Split into 3 (or 4) maturity levels. Efficiency Benefits  Less re-work required.  Meet requirements for information transfers.  A key part of collaborative working with customers and suppliers.  A step towards sustainable construction. Our own processes for moving away from “electronic pieces of paper” (PDF, Word, Excel) to database storage of information. A smarter way of working, leveraging existing technology. Considering what information you need to capture? Considering who creates the information that you need? Understanding what steps your data needs to go through? Having BIM Champions on the ground to make the process smoother. Efficiency Benefits  Increased efficiency.  More time spent on value added work.  Easy development of Quality Assurance Plans and outputs.  Instant Health & Safety File creation. Thank you Dominic For your BIM Presentation and for sharing the wide range of innovations from the session, helping us all to realise the importance of efficient data capture. In excess of 25,000 photos stored and attributed so they can be quickly located with their relevant data. Over 5000 on-site checklists completed, each consisting of more than 10 data items – giving over 50,000 individual data points that can be instantly reviewed, trended, analysed and reported on. Time savings approximated to be at least one week in 52 for every person. identified that the hidden nature of the location made it popular for antisocial drug use, hence posing a potential biohazard risk to our people in the form of hypodermic needles, or “sharps” as they are more commonly known. Reconomy specialise in environmental issues and the removal of hazards and were called upon to undertake the clearance service; hence providing a safe working environment for the team to carry out the surveys and anyone else potentially entering the site at a later date. Reconomy were the first people on the site to clear their way in, starting with any sharps in the immediate vicinity of the access gate and walkways. Interestingly, Reconomy found an existing sharps removal box full of used needles so it was evident that someone else had previously attempted, but not fully completed a clean-up. Only from being on site were we able to ascertain the need for the area to be swept for sharps. It would have been better to have been able to undertake these works during the daytime, making it easier to identify the sharps. Permanent biohazard signage could be placed at the access to the site to warn others to be vigilant from the outset of the risk of sharps. Reconomy are striving to work smarter and make the most of technology to keep their customers at the heart of their service. Hence they are well aligned to our own strategy, working together to share knowledge and experience, and provide more certainty to our project outcomes. Reconomy’s Sustainability Achievements, as pictured overleaf are indeed impressive, and through undertaking an increasing proportion of our work we unlock the added benefits of our trusted and collaborative customer relationships for all parties. Thank you Reconomy For your valued service to keeping our people safe, and your excellent sustainability achievements - from reducing our environmental impact to driving social improvements in the communities in which we work. My Personal Lean Story Ben Wilcox Over the past 12 months Ben has gone from having no experience in Lean to becoming a Lean Advocate and attending an introduction to Six Sigma. For sharing your personal Lean journey. We look forward to hearing more about where Lean will take us as a business and the benefits to our customers and the wider industry. Period 9 Feltham Top Scoring Gold Congratulations to our team working at Feltham Station. Not only have they received the Period 9 “GOLD” rating from Network Rail, but they were also the top scoring site again. They have now been the top scoring site for two consecutive periods which is an incredible achievement. Their December Edition includes articles on:• • • • • • The team have been working hard to install the additional entrance, part of the overall scheme which includes shutting the existing high risk and often misused level crossing. The site has now also taken ownership of another defibrillator which is taken to the working areas, giving that all important early access in the event of an emergency. A great initiative that could save a life! Thank you Vital For sharing our Cascade Briefing and for your great work on the rail network every single day to keep all our people and the public safe. Our earthworks team at Pirbright Junction also received a GOLD and at Sway our team received the Period 9 SILVER rating. These awards are only awarded to the best projects across IP Southern so a massive well done to all involved. Health & Wellbeing January 2019 - STOP Think! Health and Wellbeing Calendar 2019 As part of our ongoing commitment to the health and wellbeing of our people, the Health & Wellbeing Team have updated the interactive calendar for 2019. After a festive break with family and friends we encourage you all to start 2019 by giving your body a well- earned break from alcohol. “Dry January” is Alcohol Concern’s flagship Campaign which aims to raise awareness of alcohol-related problems and educate people about the health benefits of refraining from alcohol. Losing weight, Better sleep, More energy, As well as saving money! For more information visit:https://www.alcoholconcern.org.uk/dryjanuary Dry January is an excellent way of learning what your drinking habits are and how to break them, enabling you to cut down in the longer-term. NEW! Fatigue Poster As launched in the Network Rail IP Southern Safety Update at the beginning of December, the Southern Shield Fatigue Working Group have developed a poster to raise awareness around fatigue and advise on how to overcome the effects of fatigue. Fatigue is one of the biggest causes of accidents in the industry. It is described as a state of extreme tiredness resulting from physical or mental exhaustion; it can lead to reduced alertness, impaired decision-making and poor judgement of distance and speed. A copy of the poster can be downloaded from the Southern Shield website here:https://www.southernshield.co.uk/library/3/ A Toolbox Talk on fatigue is also available on the Southern Shield website. What Good Looks Like January 2019 - STOP Think! Providing Valued Solutions for our Customers (1 of 2) Maximising Efficiency within Christmas Possessions Our teams want to truly understand the needs and challenges of our customers and provide valued service led solutions that go beyond the physical build. Over the festive period they demonstrated their dedication and outstanding personal service to deliver important pieces of work to minimise disruption on the rail network. Farnham Road Bridge Strengthening At Farnham Road our team have safely and successfully completed Phase One of a scheme to strengthen the superstructure of the road bridge during a Christmas Period Possession, handing back the track six hours earlier than planned. Comprehensive scaffolding arrangements were installed to enable access to the soffit and parapets and the completed works included brickwork repairs, rivet replacements and temporary strengthening plates in preparation for the main strengthening works next Christmas. During the possession, this high profile project was visited by our customer, the RAM team, Council representatives and the Secretary of State, Chris Grayling. Special thanks to the whole team including Jason Tavenor, Adam Hinge, David Stebbings, Sam Aiuto, Bradley Mansbridge, Paul Burtoo, Noel Ford and our suppliers McNealy Brown and Alltask For your professional set up and meticulous delivery. 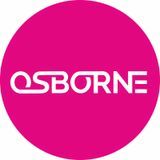 Your project was a great shop window for Osborne and clearly demonstrated our values and behaviours that set us apart from others! Providing Valued Solutions for our Customers (2 of 2) Maximising Efficiency within Christmas Possessions Upgrading the Toilets at Victoria Station When our team were asked to upgrade the basement toilets at Victoria Station to “world class” to provide a better experience for the customers, they identified an opportunity to strip-out the existing toilets when the station would be less busy. Several platforms were to be closed over the Christmas period for track upgrades so our teams pulled out all stops to complete surveys and planning to utilise this ideal period to minimise disruption at this busy station. Temporary cabin toilets were installed and the strip-out activities completed with no incidents or accidents. This was no mean feat with up to 4 layers of existing tiles and numerous old and redundant services! All achieved whilst maintaining services to all other stakeholders at the station and keeping noise to an absolute minimum for visitors to the adjacent Grosvenor Hotel. Many thanks to all involved for your superb collaboration and professionalism to complete this strip-out ready for installation of the new station toilets - including suppliers Econ Construction, Lightning Electrical, Alltask, Madagan Gill and Oliver Connell. What Good Feels Like January 2019 - STOP Think! WellChild is a national charity that works to ensure the best possible care and support for thousands of children with long-term or complex health conditions. Last year, Infrastructure and Property Services teams came together to work on a project with WellChild to create a safe and stimulating outdoor space for a very special little girl called Emma. Ten years old Emma has a rare form of epilepsy called “Lennox-Gastaut Syndrome” which causes her to have seizures every day. She has to use a wheelchair, has no speech and requires 24 hour supervision – but loves to be outside. Hence our aim was to create a safe and accessible garden for Emma to stimulate her senses and help to improve her quality of life. In true SOS makeover style our volunteer team transformed the garden whilst Emma was on a short break away from home. Working tirelessly they completed a new path and patio, raised flower beds, pergola, and water feature – along with numerous additional activities to create a great outdoor space for Emma and her family to spend quality time together enjoying the sun and fresh air. Special Thanks to All involved! Including the volunteers from our suppliers, GPB Construction and Oliver Connell & Sons. This garden will make a genuine difference to the daily life and wellbeing of Emma and her family. Our very own Engineering Delivery Manager, Malcolm recently gave a guest lecture on “Bridge Building” to first year Civil Engineering Students at the University of Portsmouth. Malcolm’s comprehensive lecture covered the many methods we use from simple in-situ concrete bridges to complex bridge launches over motorways or railways such as Leigh Road Bridge and included an exercise on how to deliver a scheme such as our Romsey Road Bridge. This lecture was part of our long association with the University that includes placement students, sponsorship and even supporting a Graduate Engineer with his part-time PhD. Thank you Malcolm for helping to secure our next generation of talented professionals. 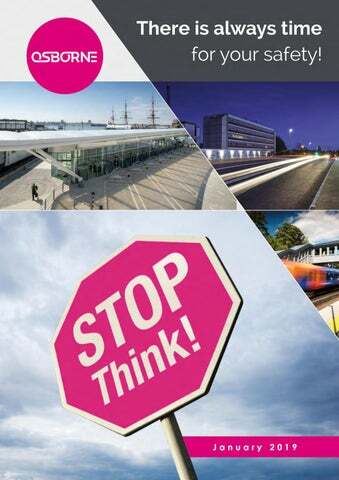 Safety Statistics January 2019 - STOP Think! A learning organisation â&#x20AC;&#x201C; Improvement Opportunity 2018 Review THANK YOU ALL! For all your ideas, good practice examples and personal interventions. 2018 was a great year for improvement opportunities, demonstrating your collective and continued desire to learn and share this learning across our business and the wider industry. December IO Statistics During the month of December the level of engagement with the IO System was reduced due to the festive break but this is expected to go up again this month as working hours return to normal and our teams undergo their Back to Work Briefings. It is great to once again see a significant number of IOs raised from our people working in our offices. Thank you for your continued engagement. Please do continue to submit your IOs on doing things differently and innovations; helping us to embed our learning culture and to continuously improve. How many has this site entered last month? Tool Box Talks January 2019 - STOP Think! External Alerts January 2019 - STOP Think! STOP Think! about… January 2019 - STOP Think! Key Points for January • Working Responsibly  Back to Work Briefings – Briefings to reverse the trend of an increase in accidents following the festive break, including tips to look out for each other this winter.  REMEMBER! If it is not safe – STOP WORK! You will be supported. • Working with Electricity  External Alert - Following an electrical fire that caused severe burns, the following restriction shall be implemented pending the conclusion of the investigation:When attending a site with Whipp & Bourne MM74 DC Circuit Breakers with 50V operating equipment in modular buildings staff shall not carry out intrusive work on the DC Switchgear in the module if there are signs of water ingress or significant condensation without a full DC isolation of the building. • Sharing New Ideas and Efficiencies  PIM Mobile - Mobile Data Capture to iGO. Please do consider using PIM Mobile for numerous quality and efficiency benefits when capturing your project information.  NEW! Mental Health App – designed to support construction workers, providing realtime support on many wellbeing topics including stress, anxiety, depression, anger and suicidal thoughts. • Heath & Wellbeing  Dry January - Giving up alcohol even for a few weeks can promote great health improvements such as losing weight, better sleep and more energy.  Interactive Health and Wellbeing Calendar 2019 – Now available via the homepage of iGO. New for 2019, it also now includes an up to date “Facts and Stats” Section that will really get you thinking.  Tool Box Talk – Driver Fatigue and NEW! Southern Shield Fatigue Awareness Poster. Fatigue is one of the biggest causes of accidents in the industry. It can lead to reduced alertness, impaired decision-making and poor judgement of distance and speed. Accidents are more likely after working long shifts, especially night shifts. • Remember  The new Design Conversations Guidance Note is now available on the Southern Shield website.